Sometimes a tree is impressive for what it looks like. Other times, for why it’s there, or who put it there. Still other times, for where it is. In the case of Portland Heritage Tree No. 1, all of these things apply. 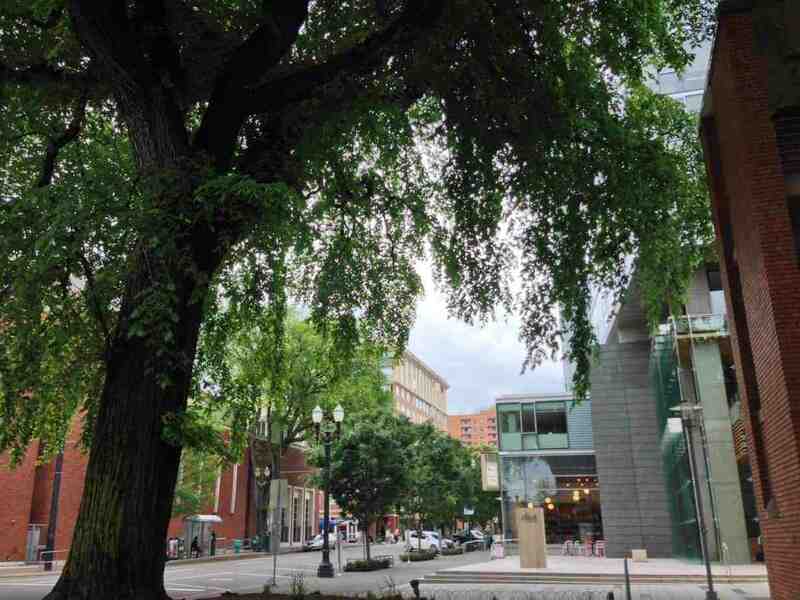 Wonderfully framed in a urban courtyard, a curvy pillar of nature’s beauty in a world of brick and concrete, an American Elm strikes a magnificent figure between the Portland Art Museum, the Downtown YWCA, and a very modern condo building. The Portland Streetcar passes right by it on SW 10th Avenue, and one of my favorite things about this tree, which really seems amplified in is setting, is to see the effect it has on Streetcar passengers. I think we are all so used to looking at trees that perhaps we forget we are looking at them. But every now on then, on the Streetcar, I see someone look around to the left, and up, and they become still for a moment. I can just about feel the pause in their energetic flow, the letting-go of the Streetcar, the city, the other people, whatever they were thinking. This is probably an unconscious act on their part, and in fact I don’t think I’ve ever heard someone, other than me, say “Look at that tree!” I don’t think it’s silly to say that, in that moment, they bond with that tree. The elm, as seen from the Streetcar on SW 10th Ave. 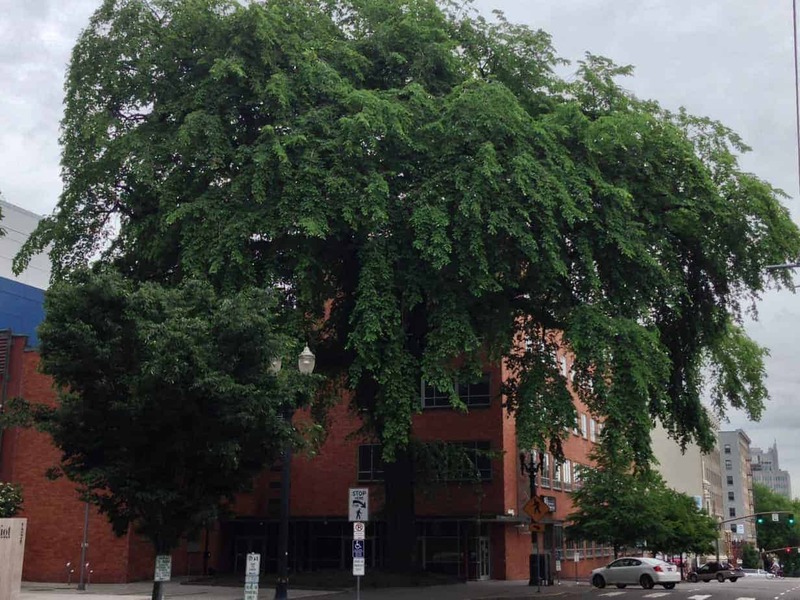 Surely, this is the reason there is such a thing as a Portland Heritage Tree – nearly 300 of them, in fact. 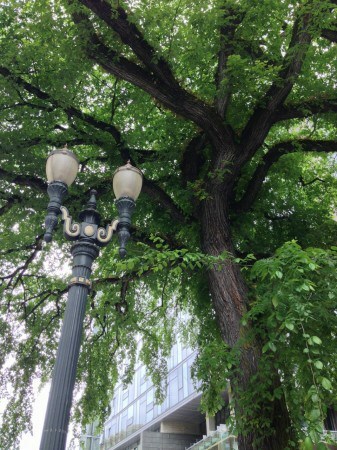 In essence, a group of civically-minded tree lovers decided that the city should simply save some trees – save these bonding moments, if you will. 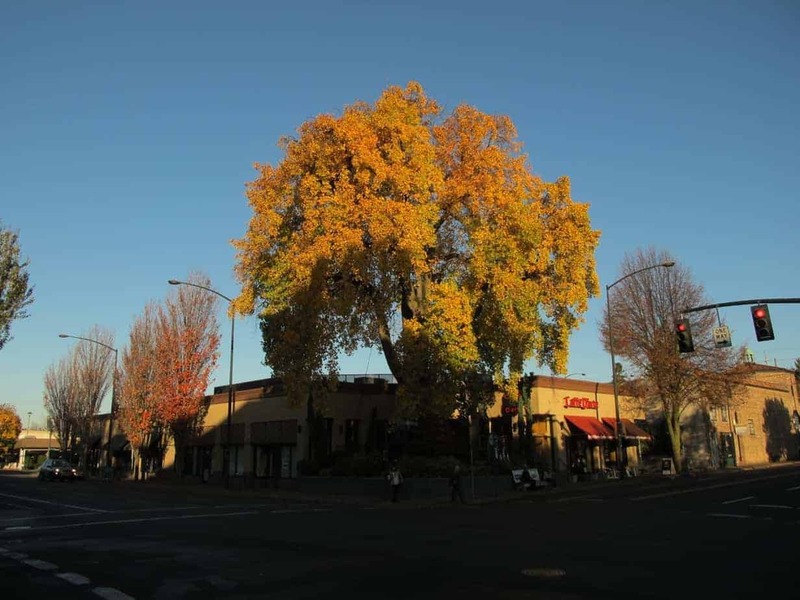 Trees are saved for their size, rarity, historical significance, or age. It even feels a little like Old Portland under the tree — and with reason. 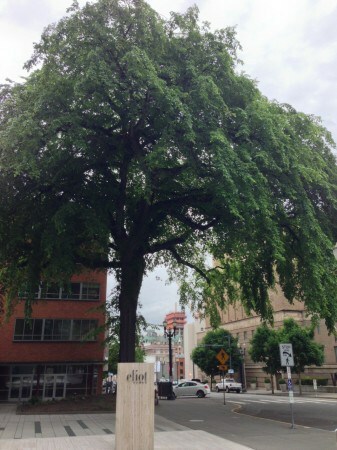 I suspect you will be even more impressed with Portland Heritage Tree No. 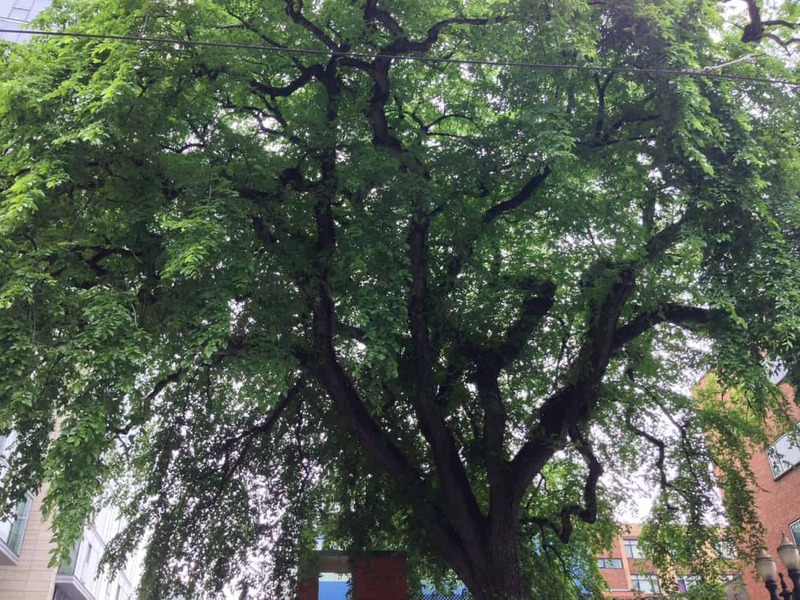 1 when I tell you the story of it (courtesy of Phyllis Reynolds, one of the founders of the Portland Heritage Tree program and the author of Trees of Greater Portland.) 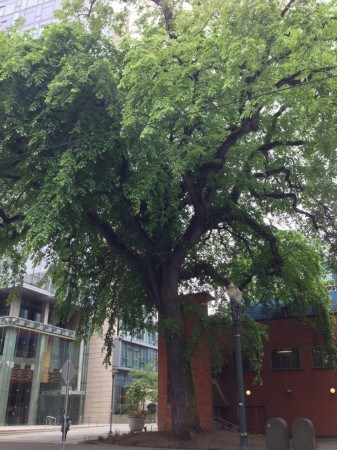 This tree was brought to Portland, by ship, around Cape Horn at the tip of South America! It was planted here in 1870 by Martin S. and Rosa Frazar Burrell in their front yard. He was a partner in the largest seller of farm equipment, and she was a civic activist instrumental in founding the Unitarian Church. It is, to this day, known at The Burrell Elm. The tree looms over the YWCA and a coffee shop. It became Portland’s first Historic Tree in 1973 and its first Heritage Tree in 1993. When last measured a few years back, it was measured at 78 feet tall with a spread – the distance between widest branch tips – of 87 feet, and a circumference of 12.1 feet. Recent renovation work and testing confirmed the tree is in good shape. A few years back, the YWCA did some renovations, and much planning was done to make sure this old tree wasn’t harmed. In a filing cabinet at the Portland Department of Urban Forestry, a three-page memo, written by Reynolds, details a meeting of Forestry officials, developers, architects, and people from the Department of Transportation. The memo lays out such agreed-upon minutiae as the shape of the cut-out around the tree, a two-inch lowering of sidewalk grade 20 feet north of the tree, the use of an air spade to make trenches for wiring near the roots, and approved pruning of the tree, with cut branches submitted for lab analysis of the tree’s health. The City takes great care to nurture this beauty. 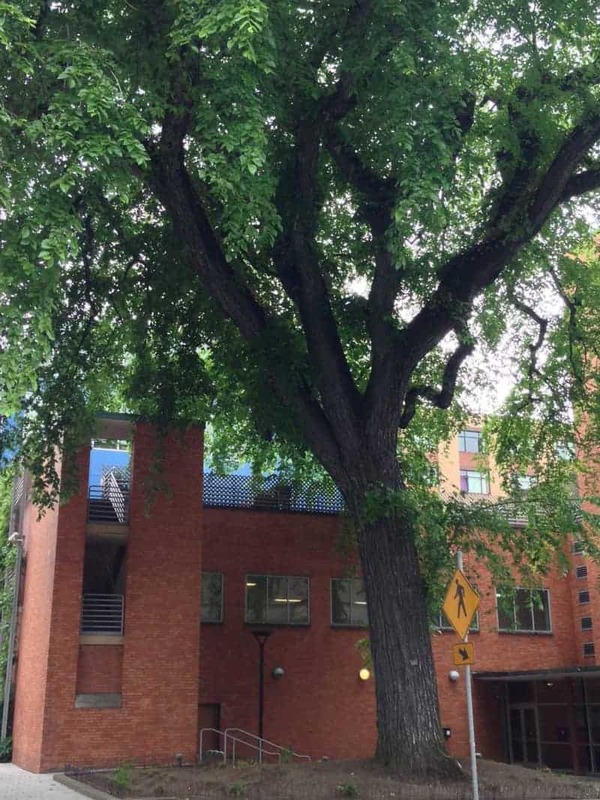 That elm is now 144 years old, and going strong. 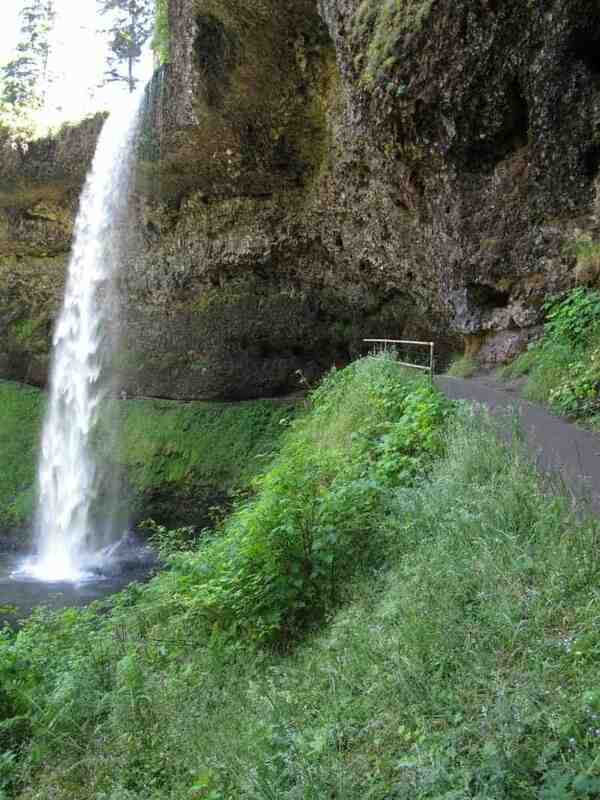 Next time you pass by it, allow yourself to stop and bond with it. Let go of where you’re going, when you need to get there, and why. Maybe imagine when this was out on the edge of town, with a big yard in front of a big house, a couple who came out on the Oregon Trail planting a little elm that had just come from back east. 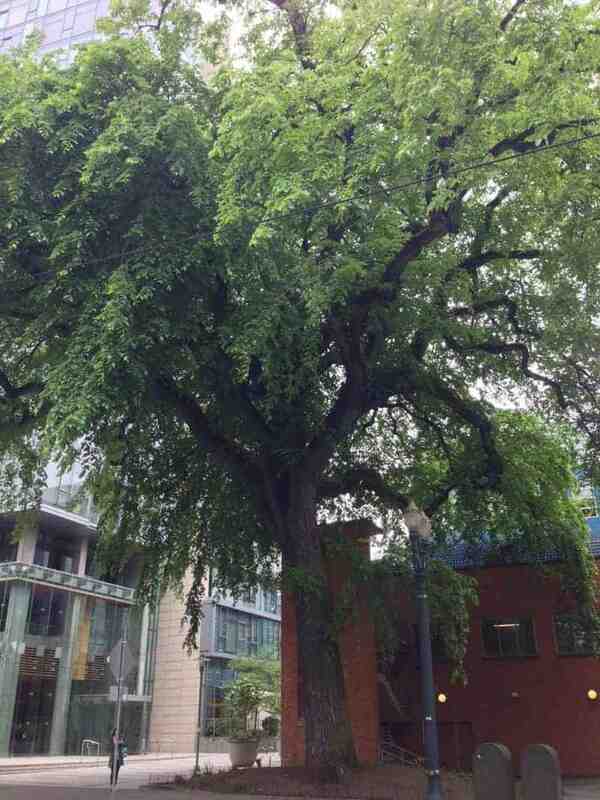 Greet that very same elm, thank it for hanging on, and be grateful there are such things as Portland Heritage Trees. 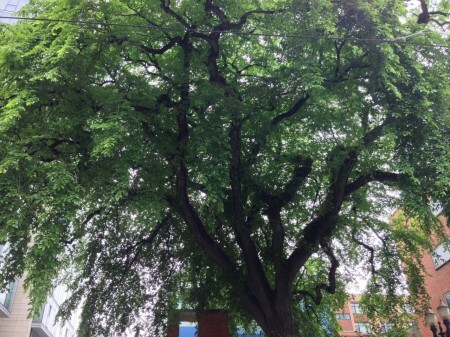 Long may the Burrell Elm live!